Newport Gwent Dragons director of rugby Lyn Jones says the region have "nothing to lose" in their European Challenge Cup quarter-final at Gloucester. The Dragons have lost their last seven in the Pro12 while defending champions Gloucester have lost successive matches in the English Premiership. "It's a fresh challenge, we go there with nothing to lose and we'll play with no fear," said Jones. The Dragons reached the semi-final of the competition in 2015. Gloucester beat the Dragons 45-17 at Kingsholm in the Anglo-Welsh LV Cup semi-final in 2011, after losing 18-12 at Rodney Parade earlier in the campaign. The English side beat Edinburgh in the final of the 2015 Challenge Cup and won all their group matches on the way to the last eight in 2016. But Jones believes his team can rise to the challenge against a Gloucester side unbeaten in their last 15 in Europe despite the Dragons' poor form. "We've got a terrible record of the highest number of losing bonus points in the league, but we've done well in Europe," he said. "But they (Gloucester) are going to turn up on the back of four defeats as well. We understand that Gloucester will be favourites but we've got nothing to lose. "Last season we went to England for the first time and won a game of European rugby (at Newcastle), we went to France and won a game of European rugby (against Stade Francais), and this year we've been to France and won (at Castres). "So going away from home in European competition is not an issue for us." 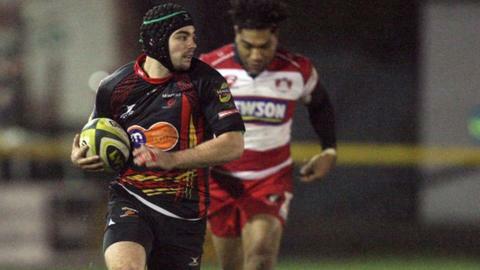 Dragons skipper T Rhys Thomas admits the squad have to take their share of responsibility for the recent slump in results. "It hasn't been where we want to be as a region but the players, we've had an honesty call amongst ourselves and taken a lot of ownership. We feel as though we've let everyone down," he revealed. Gloucester have experienced Wales internationals James Hook and Richard Hibbard in their squad as well as back-rower Ross Moriarty, who scored two tries for Wales against Italy. Dragons three-quarter Adam Hughes knows his side will have to close Hook down if they are to stand a chance of upsetting Gloucester. "He's very dangerous with ball in hand so you never know where he's going to pass or if he's going to go on his own. You've got to stay on him and his kicking game is really good."